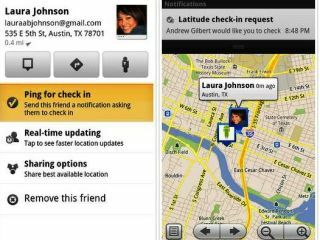 Google has updated its Android Maps service to include a whole host of new social networking options. Google Maps for Android 5.2 now lets you review eateries and find your friends more easily using the Daily Mail's favourite service, Latitude. The former takes Google's Hotpot service (where you can download an Android widget to your homescreen to easily give a restaurant a star rating) and extends it so you can not only rate and review a place, but also instantly share it up to Twitter from your Android device. The other big change is to do with finding your friends when out and about - and negating the need to send that slightly-creepy 'Where are you?' text. Instead, you can ping them to ask where they are through the app - it shows on their Android phone in the notification bar. When they update, the ping flies back to you, and you can then go and find them. Of course, this is another example of something taking a lot longer than a simple phone call, but if you're in unknown territory, it could be a pretty handy tool. The Maps for Android 5.2 update is in the Market for 'everywhere it's available, which currently doesn't seem to be the UK, but at least it's compatible with Android 1.6 and above.